First of all thanks to Microsoft for providing Microsoft IE 9 browser to Windows Phone 7.1(Mango Update). With the introduction of HTML 5 and CSS 3 in Microsoft IE9, web development is easier for Windows Phone devices. 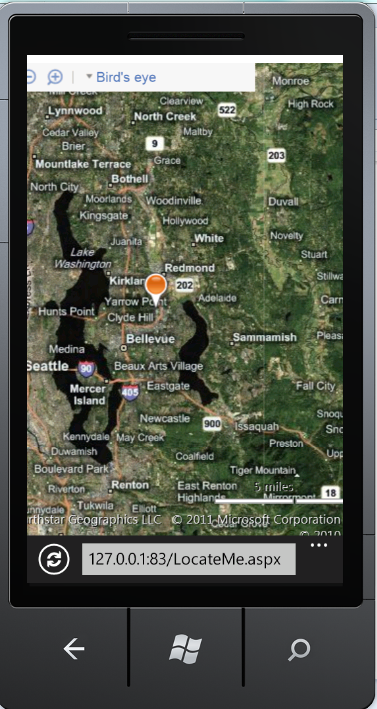 In this article, let us see how to show Bing Maps on Windows Phone 7.1 device and pinning the current location on the go. First of all, create a Bing Maps Account, which is free of cost from the link – http://www.bingmapsportal.com/. Once you are done with creating account, log into Maps Account center and create a key by providing the “Application Name” and “Application Type”. Now copy the Key/URL and save it in notepad. Now launch Visual Studio 2010 and create a new Web application. Change the doctype to HTML 5 doctype, as shown below. Add the following code in the <head> section. Now copy the following code in the <body> section. Now replace the text “Your Key/URL” with the key, which you have saved already. Once you are done with it, you are done with the coding stuff. Now testing it on Windows Phone 7.1 emulator. NOTE: The above sample won’t work in Windows Phone 7. It work’s only with Windows Phone Mango Update, for which developer tools are available from the Microsoft’s website. The above sample works absolutely fine in Desktop browsers too (Microsoft IE9, Mozilla Firefox 4, Google Chrome 12). It also works in Mobile devices which support HTML 5 including Apple iPhone. Happy Web programming for WP7.1!!! If you want to put up a confirm message to the user, so that he will be notified for any unsaved data. Check the following code snippet, which will alert the user, before close the browser/tab/moving to next page. Copy the above code the page, where user needs to save information etc., The above code works in all latest browsers!